In her bushland management and landscaped work Joanne Mott deals with many plants. From the rarest indigenous orchid, now reduced to an inhabit few known patches, to rampant introduced species, ever spreading to choke waterways and impede ecological balance. Colonisation and globalisation has seen plants spread to and from all corners of the world. They are perceived as friends or foe, depending on one’s perspective. Airborne, waterborne, bird and cargo borne, or borne in the luggage of homesickness, introduced botanic cultures are now complexly woven into the Australian landscape. 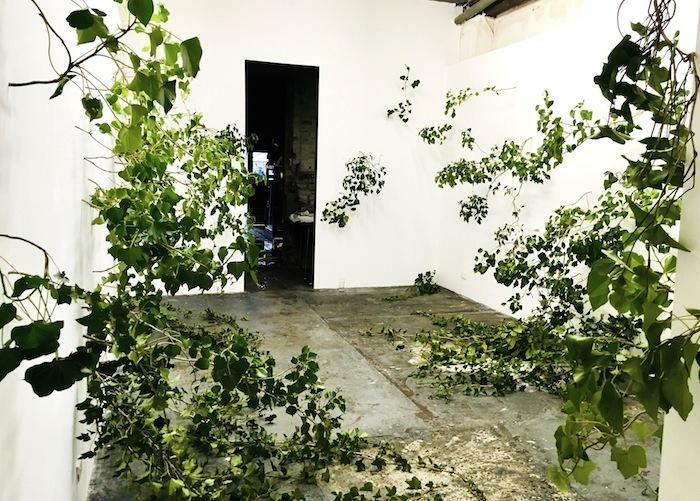 Hedera Helix enacts the reduction of an invasive “weed” species, English ivy botanic name Hedera Helix, which was strangling eucalyptus, acacias, ground covers and grasses from bush land to create this work. Now this incursion on native flora has become a twisting terrain for us to negotiate though the gallery space.